African Violets were first collected from eastern Africa and Tasmania in the late nineteenth century. 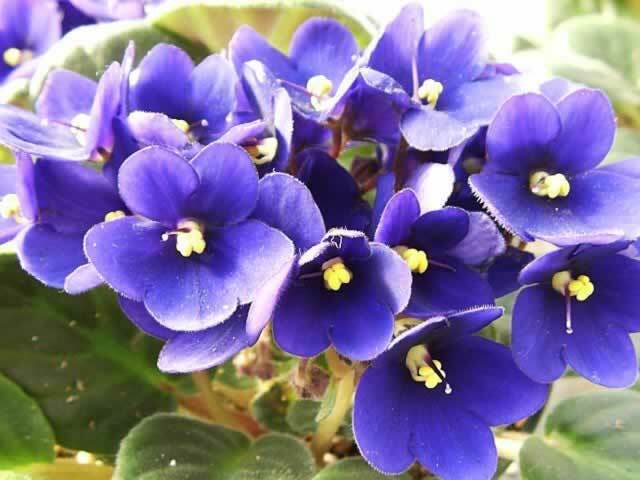 have made the African Violet the most popular flowering house plant in the world. they should be planted in moderately moist, rich, well draining soil in partial shade. 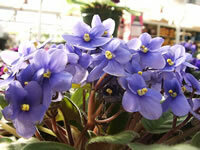 African violets need about fourteen hours of bright, indirect light each day for the best flowering. It may be necessary to provide supplemental light for them by using a Gro-Light, especially during the winter months. They should be planted in the smallest possible container because they need to be somewhat root bound to bloom. Grow them in a rich soil mix containing 1 part potting soil, 1 part peat moss and 1 part perlite or coarse sand. 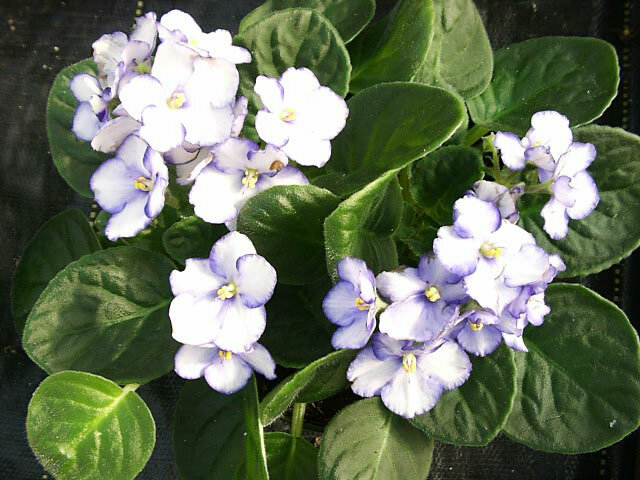 If you prefer, there are also many specialty mix African Violet soils also available. and certain trace elements that aren't available with an all purpose food. The A V food will take care of these specific needs. The chlorine used in public water systems can be deadly to many houseplants. This is especially true with African Violets. I always recommend that you fill your watering container, and let it sit for a minimum of 24 hours. The chlorine will have dissipated by then, making it somewhat more safe for your plants. The water will also be at room temperature, which is much less of a shock to the plant. When watering African Violets, take care to keep water off of the foliage, flowers and crown of the plant. Bottom watering is the best method, but never leave your plants sitting in water for more than an hour or so. This can quickly cause crown rot which is fatal. African Violets like a great deal of humidity (40-60%) but not wet leaves and stems, so misting is not an option. Setting the pots onto water splashed, pebble filled trays will often solve this problem, as will having an aquarium in the near proximity. Spent flowers should be removed as soon as they begin to fade. This will allow the plants energy to be used to produce new blossoms rather than seeds. If you have a chance, try growing violets under fluorescent Gro-Lights. The colors of both the flowers and foliage will become more intense and bright. Repot your African Violet plants annually with fresh soil. It is best to only increase the pot size by an inch or so. because they are by far more succeptable to damage than either the leaves or roots. African Violets are easy to propagate by division or by using leaf cuttings. but the winter months when the plant is less inclined to bloom seemed to work the best for me. Prepare a cutting tray or pot by filling it with a loose mixture of peat moss and vermiculite. Allow about 4 square inches of surface area for each cutting you intend to take. Water the soil well to be sure that it is settled and moist. grasping the stem and gently twisting it until it pulls free. With a sharp, sterile knife or razor blade, cut the stem at an slight angle (matching the angle of the leaf), 1-1 ½" from the leaf. Insert your cutting into your rooting media deep enough that about ¼-½" of the base of the leaf is covered by the soil mix. Gently press the soil around the cutting.Keep the rooting media evenly moist, but never soggy. Place the tray in a warm (70°-75°), brightly lit area (not full sun). The cuttings should begin to produce roots in about two weeks, you should have a new plantlet in about eight weeks! Bottom heat and a grow light will speed up the process considerably. Growing African Violets from seed is not as fast as growing them from leaf cuttings but it is a great way to add to your A V collection. Seed packets will usually contain many different varieties and colors of flowers. Do not cover the tiny African Violet seeds with soil because they require light for germination. Sow the seeds on a bed of well draining, finely screened growing medium, then cover the tray with a pane of glass. Maintain a temperature of 70°-75° within the growing medium. Germination takes 20-25 days but can be sped up with the use of fluorescent lighting. Blooming takes up to eight months.